This week, we finished the study of the theme “I love numbers”. I have already shared the teaching plan of the “associative teaching method” based on this topic. This week I plan to share some of the practice games to further consolidate the theme. 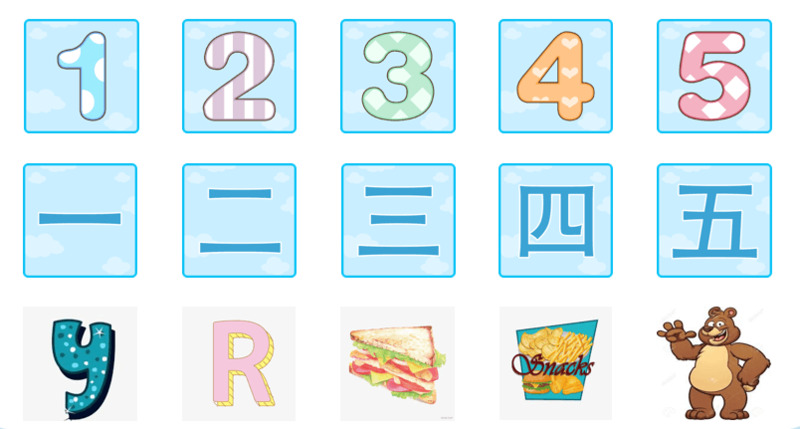 Like the theme “Greeting” I introduced before, this theme of “I love numbers” is to learn basic knowledge in the first several classes. Then the last one or two classes teach them simple sentence structure based on the theme. The content of this class is the question word "how much" (in the previous section, students have mastered the words "more" and "less"), "Ji" means “how many/how much”; the noun "Sui" means “Age”. So the simple sentence is -“How old are you?" -"I am * years old." With the knowledge of personal pronouns learned in the “Greeting” theme, students can do a lot of replacement exercises. Game 1: You show I say. Teachers need to prepare a set of basic flashcards: mine is the first level of hihilulu flashcards. If you do not have it, you can download the Chinese character coloring card in the hihilulu Parentroom or print it by yourself. I will find two students to practice each time: One person will take half of the cards. If one succeeds in saying right the pronunciation of the word, he/she continues. If one makes a mistake, he/she needs to exchange their cards with another. The final winner will be the one who “eat” out the cards of another first. Game 2: Decipher the number. Divide the students into two groups. Teacher writes a series of Arabic numerals on the blackboard. And then these two groups will answer the questions and see which group reads the numbers quickly and accurately. If a group continually grabs the right to answer, the same person cannot answer the question continuously. Every time the teacher finds two students to practice. Teachers write Arabic numerals and then ask them to write the corresponding Chinese characters. The more they write the right ones, the more they win. Game 4: Clap with me. The material used here is still the flashcard. Every time the teacher finds two students to practice, the teacher can say two numbers at random. Then, these two students find out these two numbers separately, then raise hands to call out "give me five". Let students prepare a 5*5 grid paper. Write down a number in 1-20 range randomly in each grid, and the remaining five grids can write any number within 100. Then the teacher starts to call numbers: if students hear a word in their own grid, they draw a circle. If a student completes a line, the Bingo form is completed and the game is over. These five can be used to do Chinese game exercises. If you want to active the classroom atmosphere, you can let students master the content through the game. I believe that you also have a lot of efficient and interesting teaching games like these, welcome to share!